I love having biscotti with my coffee. The hard, crunchy cookies are perfect for dipping in a hot cup of coffee or a latte, and they usually come in flavors that are very complimentary to coffee, as well. I like to make my own biscotti, of course, but I also pick them up when I am out having coffee at a coffee shop. I have had great luck with the biscotti at Starbucks, which have a nice consistency and some good flavors, like the Spiced Chocolate Biscotti that inspired this homemade version of that cookie. 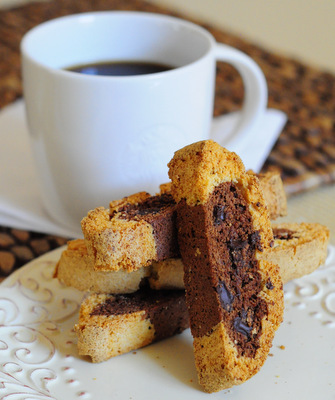 The Spiced Chocolate Biscotti at Starbucks is a two-tone biscotti with a layer of vanilla dough and a layer of spicy chocolate dough. I tried to stay as true to the original as possible. The chocolate portion of the cookie has a real kick to it, thanks to a generous dose of cayenne pepper. It has the same kind of flavor profile that you might find in Mexican chocolate, with cinnamon and almond in addition to the cayenne pepper and cocoa powder. I also added chocolate chips to the chocolate dough to make it a little bit richer. The vanilla dough is a sweeter contrast to the spicy chocolate dough. It is simply flavored with vanilla extract. Both doughs are fairly thick, so they are easy to shape to get a two-tone look. Pat the chocolate layer into logs on your baking sheet with lightly floured hands. Then, again with lightly floured hands, form the vanilla dough into a thick, flat sheet and drape it on top of the chocolate log. You can do this in several pieces, as the seams will meld together as the cookies bake. 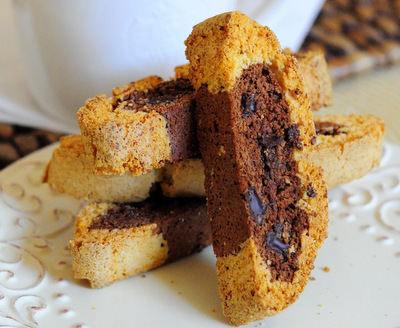 Biscotti are always baked twice, once as a log and once after slicing. It is a good idea to allow these to cool before slicing them to give the chocolate chips a chance to firm up, since that melty chocolate can actually damage the structural integrity of the biscotti when you try to slice it (i.e. they will squish instead of slice if the chocolate is too hot and your knife is not sharp enough). After the cookies are firm from their second round in the oven, they can be cooled and stored in an airtight container. They’ll last for at least a week – which is about how long it should take you to eat through this batch and need to make another. Make the Vanilla Dough: In a medium bowl, whisk together flour, baking powder and salt. In a large bowl, cream together butter and sugar until light. Beat in egg and egg white, followed by the vanilla extract. With the mixer on a slow speed, gradually incorporate the flour mixture, stirring just until no streaks of dry ingredients remain. Set aside. Make the Chocolate Dough: In a medium bowl, sift together flour, cocoa powder, baking powder, cinnamon, cayenne pepper, instant coffee/espresso and salt. In a large bowl, cream together butter and sugar until light. Beat in egg and egg white, followed by the vanilla and almond extracts. With the mixer on a slow speed, gradually incorporate the flour mixture, stirring just until no streaks of dry ingredients remain. Divide the chocolate dough in half. Dollop the dough onto the baking sheet in two rough logs. With lightly floured hands, shape each into a log about 1-in high and 8-10-in long (log should be quite narrow) on the prepared baking sheet. Leave 4-5 inches between logs to allow for spread (or use two baking sheets). Divide the vanilla dough in half. With lightly floured hands, shape each half of the dough into a rectangular blanket about 1-cm thick and drape it over the chocolate log. Cut off excess and use to patch holes in the dough. Chocolate log should be completely covered. Bake logs for 25-30 minutes, until golden. Cookies will spring back when lightly pressed in the center. 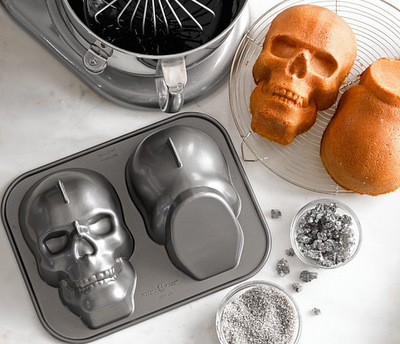 Allow dough log to cool on a wire rack for 20-30 minutes, then slice into cookies 1/2 â€“ inch thick using a sharp chefs knife or serrated knife. Arrange upright on baking sheet. Lower oven temperature to 350F. Bake cookies a second time for 20-25 minutes, until they are lightly browned on the sides and slightly crisp. Top and bottom of the biscotti should be relatively dark. Makes about 24-36, depending on thickness. Perfect for these upcoming chilly nights! Wow, this is wonderful. Thanks for sharing this. I have been making Italian biscotti’s ever year for the my family for the Holiday season. I have to try this for the upcoming Holiday season. They might like something different. And this is certainly different from what i have been making.